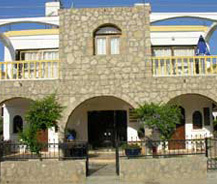 Fian Bungalows are a tourist terminal located at a distance of 3 miles from the town of Western Kyrenia. The pleasant environment and the scintillating view of this place make it an exceptional place to stay. The shape and style of the hotel premises will make you feel the genuine Cypriot architectural style. Fian Bungalows gives you an extensive range of options for accommodation. You can comfort yourselves in cottages, bungalows and beautiful rooms. Guests are facilitated by all the installations like shower, kitchen, and air conditioner to provide utmost comfort levels. All these edifices are confronted with magnificent mountain and oceanic views. You can cherish the time with you loved one under the exquisite setting of rising or sinking sun. Food offered by the hotel is a classy illustration of unfeigned Cypriot flavor. Shoppers can witness the conventional Cypriot artistry and craftsmanship of the locals in the near by markets. Fian Bungalows is only fifty yards away from the sea. The beach is very safe for your kids. You will certainly relish this proximity of the deep blue sea along majestic mountain range. This place will stun your eyes with its beauty and carves out the best holiday for you and your family.